Role on PrISUm: I am PrISUm’s Outreach Director. As Outreach Director, I work with schools, organizations, and individuals to coordinate all PrISUm outreach events. Outreach is an extremely important part of what we do as a team. We strive to educate our community on the importance of sustainability and the future of transportation. I facilitate STEM activities with students of all ages and give presentations on solar car in various settings. Career aspirations: I would love to teach at a Spanish immersion or bilingual elementary school. I have always loved children and my favorite part of teaching is watching their eyes light up when they figure something out. 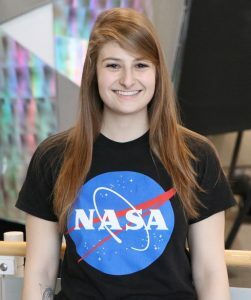 That being said, I am currently an intern at the NASA Ames Research Center in California, working with NASA outreach. I’m excited to see where life will take me, assured that I will always be involved with STEM education in some form. My favorite part of being part of PrISUm is the sense of community and the constant teamwork and collaboration. We take pride in being an interdisciplinary organization and teamwork is essential for all aspects of PrISUm. I would advise students to be open minded and take opportunities when they are provided, even if you’re scared. If you’re interested in joining PrISUm, we have a place for you. Three years ago, I never would have imagined my life the way it is now. Embrace the opportunity to learn new things, you never know where life will take you.